234RC Tilt Head for Monopods, with Quick Release is rated 4.6 out of 5 by 452. Rated 5 out of 5 by DVS Jamaica from Tough! I tend to believe this little guy is really a spare part from a tank! I use it with a Manfrotto 776YB 4-section compact monopod. Mostly made from solid steel it's really sturdy. The plate slides in easily and automatically locks so tight I can slide it in, hear it click and raise my DVX100B 15 feet in the air with my monopod to get an over head shot with no worries. The tilt lock knob goes between tightly locked and unlocked in less than a complete revolution making it really quick to change tilt angle. Even allows for some amount of drag if you stop short of totally tightening the tilt knob. If you break this, you really had to be trying VERY hard! Rated 5 out of 5 by Bmoore3 from Great addition to mono pod or tripod The Monfrotto 234RC Tilt Head is being used on my Monfrotto 679B three stage mono pot. It works great with my DSLR cameras and normal lens. The tilt head has a weight limit so I do not use my heavier lens (long lens) on the mono pod with the tilt head attached (for those I use use the mono pod). The 234R tilt head is strong and easy to attach and use. The quick release feature allows me to switch cameras without spending time switching out the mounting plates. I shoot mostly nature and landscape and local events. The size and ease of use make it a must for my camera bag. Great quality and a very good price. Rated 3 out of 5 by Sean Molin from Well built, simple, but limited motion. I have a Bogen 2541 6x carbon fibre monopod, and I bought this head through several recommendations.It's solid and works well for what it does, but I'm severely disappointed with the range of motion. Maybe I'm missing something, but I'm surprised that there's so many 5 star reviews with this fact. If you set it so you can switch from vertical to horizontal, the only way to tilt your field of view up or down is to physically tilt the monopod, which limits being able to look low or high.I wouldn't necessarily say it's heavy, but compared to my monopod it is. It's 50% of the total weight. I won't consider that a con. Rated 5 out of 5 by Bud from Years of use and satisfaction Have owned this monopod head for years, three trips to South Africa, many state side. Have mounted a Sigma 50-500mm, a couple Canon 100-400mm, 70-300mm and many other lens camera combinations. I'm sure exceeding the weight limit.I find if I tighten the friction just enough to be able to force some tilt it works easier than releasing the frition, adjusting, tightening. Like any other accessory you still need to pay attention, wear a camera strap. Now 75 I need camera stability and this will extend my enjoyment of shooting, hopefully for a few more years. Rated 4 out of 5 by Jdmhood from Great little tilt head Love this tilt head, it compliments my Feisol CM-1471 Carbon fiber monopod nicely. This tilt head lets me use my monopod more effectively implementing more complicated techiques. The lock is tight and doesn't really allow droop with semi long lenses such as the Canon 70-200 f/2.8L. The QR plates are snug and doesn't move when locked down (which is good). Only thing i wish it could improve on was the instructions, it took me a few minutes to figure out how to unlock the lever. Another thing i wish for is the implementation or a universal QR system such as the Arca swiss plates. Overall great head for a excellent price. Highly recommended. Rated 5 out of 5 by JamesO from Great head for a monopod I purchased this to put on a Bogen/Manfrotto 679 monopod. The monopod comes with a screw mount but it's fixed in place. This head allows you to pivot the camera up and down (or sideways). Many people prefer this type over a ballhead because with a monopod, you can easily turn the pod itself, so this makes positioning the camera a little less complicated. This head is simple and easy to use. It's medium-weight for its size and fits nicely on my 679. Even with the head in place, the monopod is still nicely balanced. A heavier head would make the pod topheavy. The head is heavy enough to secure my Canon 40D and a 70-300mm IS lens (my largest) without moving. The version I bought has a QR plate. On a monopod, a QR system is especially nice since I typically pop the camera on and off it numerous times, while I tend to mount a camera once on a tripod and leave it for awhile. The plate fits securely on my Canon and isn't annoying if I leave it in place while hand-holding. The plate slips in and is held very securely. This head has a double-lock. There's the main flip-catch, but there's also a rotating pin lock as a safety. If you put the pin in place, the flip-lock won't release--so you can't accidently release the camera if you bump the release. You can, however, leave the pin unengaged if you don't want the safety. I like having the choice. All in all I'm very happy with it. Rated 4 out of 5 by Roger from Monopods, Tilt Head camera mount The tilt head mount is simple and lighter than my other Tripod heads, but when used with my monopod provides acquit angle positioning for shots that would be performed with the combination. The head is equipped with a quick release that is the same floor plate as my other tripod heads, allowing me to not have to switch or reconfigure in order to use.For my monopod set up this head is low profile, lighter than other options and easy to use with one friction knob control. Quick lock and unlock, like found on my ball head and pan head mounts.I recommend this head for those hiking with cameras, using a monopod for steadying shots. Rated 4 out of 5 by Anonymous from Go Vertical I use this swivel/tilt head on my Manfrotto 680B monopod. It's effective for getting vertical photos, and for horizontal shots angled up or down. I only recently started to use a monopod for some of my pictures. A monopod gives you that added steadiness for slower shutter speeds. A swivel/tilt head is an absolute must-have for a monopod, otherwise you'll be limited to only horizontal compositions. I guess it's a little heavy, big deal. If all you can complain about at the end of the day is that the swivel/tilt head on your monopod is a little heavy, you probably need to go to a gym. Is this head compatible with the Joby UltraFit Hand Strap with UltraPlate? Does this QR fit Really right Stuff plates? No, it does not. The Manfrotto RC2 Quick Release Plate included with the Manfrotto 234RC Tilt Head is only compatible with Manfrotto tripod heads that use their proprietary RC2 Quick Release system. It is not interchangeable or compatible with Really Right Stuff plates. Will the manfrotto- 234RC tilt head mounted on the manfrotto 681B monopod be suitable for use with Nikon D7100 and the Nikon 200/500,f5.6 zoom?? You will want a more durable head, as this tripod head is only rated for 4 pounds of support. 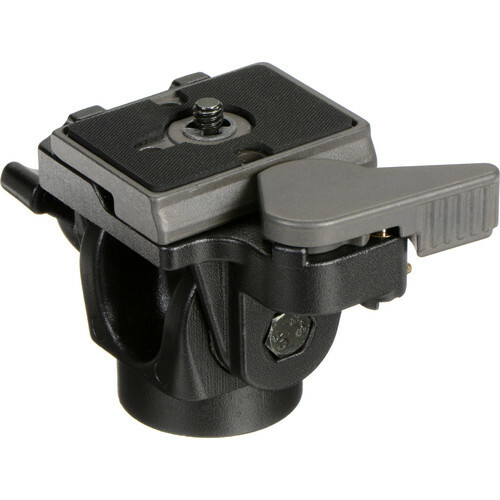 Does the screw on the top of this head fit a point-and-shoot camera? Or does it only fit a (D)SLR? Yes, the screw on the top of this head will fit point and shoot cameras. It uses the industry standard 1/4 -20 thread size which is the size photo cameras use. hello will this head fit on the manfrotto compact aluminum monopod advanced? I do not have that type of monopod, mine is a Gitzo and work's OK. The head does not hold my 1Dii and 400mm very steady, but will hold my 1Dii and 70-200 F4 OK.
Do the 234RC and the older 3229 both use the 200PL-14 QR Plate? Concerned about interchangeability between the two heads. Yes they do both use the 200PL-14 QR Plate. Manfrotto states this head is rated at 5.51 pounds not 4.41 as BH says. I'm guessing a typo by BH but does anyone know for sure? If you have this head, was the load rating mentioned in the documentation? Thanks, a 25% difference in the load would put this head where I want it. The brochure that came with my Manfrotto 234RC says that the safety payload is 5.51 lb. I use it routinely to mount my Nikon D800 and 70-200 telephoto lens to a monopod and it holds securely when the lens is either horizontal or vertical.